The Veterinary Emergency and Critical Care Society has stringent staffing requirements before emergency veterinary facilities can achieve Level 1 certification. 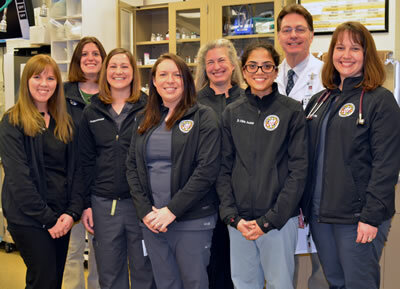 The MU Veterinary Health Center Small Animal Emergency and Critical Care Service includes licensed DVMs (from left) Heather Honious, resident, Christa Bernhard, resident, Meghan Harmon, clinical instructor, Nicole Trenholme, resident, Marie Kerl, teaching professor, Vibha Rajagopalan Asokan, resident, Tony Mann, professor and section head, and Elizabeth Easley, clinical instructor. 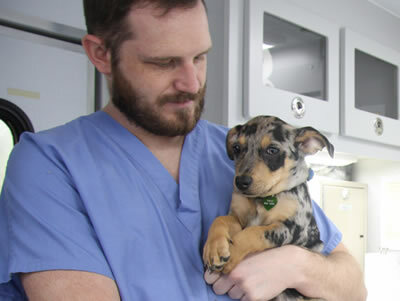 The Small Animal Emergency and Critical Care Service at the University of Missouri Veterinary Health Center has received certification as a Level 1 Veterinary Emergency and Critical Care Facility. The Veterinary Emergency and Critical Care Society bestows the certification to recognize hospitals that meet and exceed established minimum standards. There are three possible levels of certification available to veterinary facilities that provide emergency and critical care. Level 1 facilities must be open 24 hours a day, 365 days a year with staff specifically devoted to care of emergency patients including at least one doctor of veterinary medicine and a certified technician on duty at all times. They must have specified equipment on hand, and staff in place who have undertaken specialty training needed to provide sophisticated emergency and critical patient care. They must also employ full time someone who has achieved diplomate status in the American College of Veterinary Emergency and Critical Care and are recognized as specialists in the field. The Small Animal Emergency and Critical Care Service at MU has three faculty members who are diplomates. The MU VHC is one of only 24 facilities in the country and the only one in Missouri that have earned Level 1 certification from the Veterinary Emergency and Critical Care Society. “We can offer our patients advanced care, mechanical ventilation, surgery, anesthesia and the highest level of pain management and control,” said Marie Kerl, DVM, MPH, DACVIM ‒ Small Animal Internal Medicine, DACVECC, teaching professor at the MU Veterinary Health Center. Kerl said to obtain the certification, she submitted an application to document that the facility, staffing and level of patient care provided met the VECCS’ criteria. The certification is valid for two years. The VECCS is an international, professional society of veterinarians, veterinary technicians and managers dedicated to promote the advancement of knowledge and high standards of practice in veterinary emergency medicine and critical patient care.